The Terrible Threat of the Living Brain. The referee in the boxing match is presumably the aforementioned Coach Smith. Mr Petty refers to the machine as an "electronic brain"; the term "computer" isn’t quite current. This is the first issue in which neither Aunt May nor J. Jonah Jameson appear as characters. 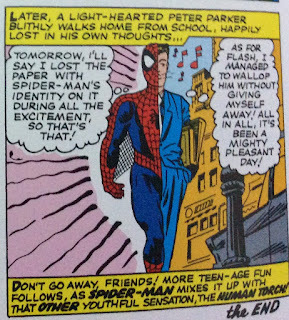 Parker’s specialization: The representative from ICM is surprised how much Peter Parker knows about electronic brains. Spins a web, any size: Spider-Man spins a huge spider-web that blocks a whole doorway. This issue sticks out like a moderately sore thumb in the first run of Spider-Man stories; almost as if it were a pilot for a reboot that never happened, or a change of direction that never went anywhere. It's set entirely at Peter Parker's school; neither Aunt May nor Jonah Jameson appear. It's shorter than usual, leaving room for a 6 page filler which I suppose we’ll have to talk about in a moment. Lee says on the letter page that it was a "change of pace" and promises to be "back on track" next time. I wonder if cancellation had been looming again, and Lee was preparing to re-launch Spider-Man in an anthology title? Or did he have the Torch strip lying around and think that it made economic sense to use it? Or was there a scheme for a Spider-Man-at-school spin-off title? I cannot believe that these stories were written with a “tribute to teenagers” special in mind. On the basis of this comic, teenagers mainly call one another names and have fights. Some tribute. Think of Buffy the Vampire Slayer: objectively the greatest genre TV show which doesn’t have naked people and dragons in it of all time. Buffy spends her first four seasons slaying vampires mainly within the confines of her high school. The weekly battle with a supernatural monster generally ironically reflected whatever personal issue she was dealing with in the same episode, so if she was struggling to see the point of a history exam she might find herself dealing with a monster who was endlessly doomed to repeat the mistakes of the past. This kind of thing almost never happens to Spider-Man: in fact, it is surprisingly rare for the threat which he is is facing to impact directly on Peter Parker at all. Certainly, this issue consists of two separate plots, rolling along in parallel, bumping into each other at key moments and leading to a farcical conclusion. 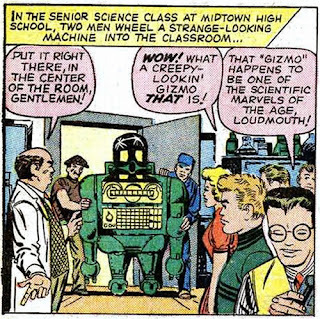 So: in the first plot, Dr Petty from the "International Computing Machine Corporation" demonstrates his "electronic brain" to Peter Parker’s science class. It’s a beautifully Ditkoesque creation, very much the sort of thing which would have appeared in Amazing Adult Fantasy — like a toy robot, but not quite like one. It runs around on ball bearings and has claws exactly like the ones on the end of Doctor Octopus’s arms. Two goons (and can’t Ditko draw a lovely bad guy, the fellow on the left looks more like one of the Mole-man’s troll creatures than an actual human) decide to steal the machine and use it to "figure out horse race winners, elections, anything". While they are trying to steal it they accidentally "bump into the control panel" causing it (and I hope you are keeping up with all the scientific jargon) to "short circuit". The machine runs amok, and there is a big fight, up and down the corridors of the school. 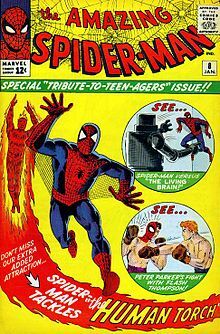 The Brain, while not evil, is able to learn Spider-Man’s moves and avoid him. In the end, Spider-Man — or rather, Peter Parker — outwits the machine, removing the control panel and flipping the cut off switch. Some of the world’s silliest jokes involve telling the listener something in the first line, leading them in a completely different direction, and then delivering a punchline which takes them back to where they started. (*). This story is structured exactly like one of those jokes. Many reader’s think of this as a below par issue, but I’m rather a fan: I like the sense of fun and the relative lack of angst; Peter Parker in his natural environment, and the sense that despite the monster and the fight, this is pretty much just "a day in the life" for a superhero. At the end of last issue, Peter had his arm chastely round Betty’s shoulder, flirting among the filing cabinets. 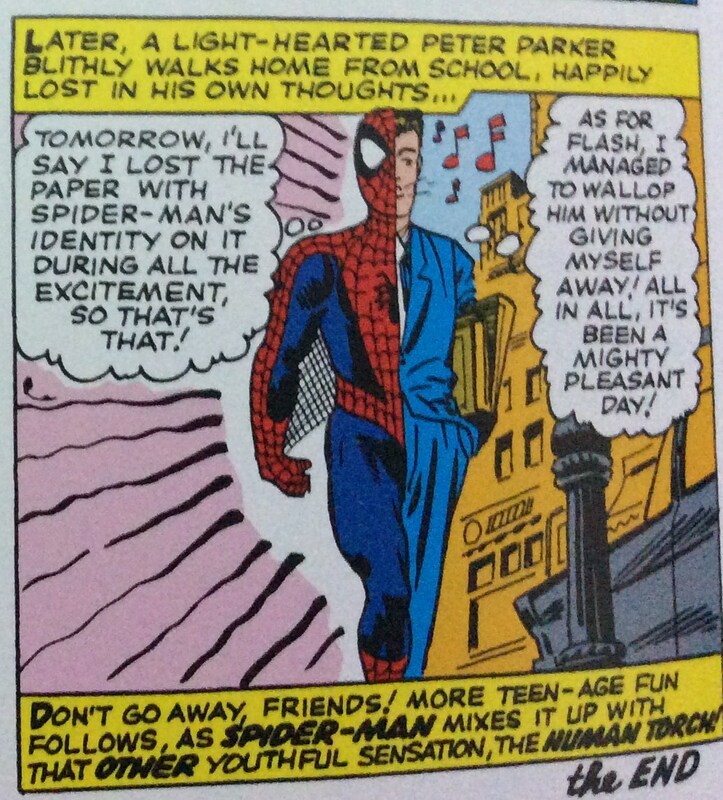 This issue ends with him walking home thinking "All in all, it’s been a mighty pleasant day". Other issues have ended with him crying; this one shows him whistling. A pleasant day involves fighting a dangerous non-human foe and punching another boy, quite hard. There have been two instances of the Gemini-face in this issue — when Parker decides not to replace his glasses, and when he is about to fight Flash and can’t work out how to avoid killing or injuring him. But this is, I think, the first time we have seen our hero’s whole body split in two, Spider-Man down the left side and Parker down the right. And the message is: Peter is fully at ease with being Spider-Man. Yo Spider-Dudes. Give me some money. Do you think I do this for fun?